Double glazing has changed dramatically over the last few years, from the original two sheets of float glass with a very small spacer bar to today’s high spec double & Triple glazed sealed units. Double glazed sealed units are constructed of two pieces of glass bonded together the double glazing glass panes are kept apart by a spacer bar (available in various sizes that determine the size of the unit) which contains hundreds of tiny silica balls. These same balls can be found in the little bags you find in the packages when you buy electrical goods to keep then dry and free from moisture. It is these balls which soak up any moisture which exists in the air gap between the two panes of glass. They are sealed together with a flexible sealant to the outside. Still air remains between the panes of glass that acts as the thermal barrier. These are called standard insulated units. These can incorporate various sizes of different glass, can be toughened, decorative effects can be added even the glass upgraded for increased thermal efficiency. Heat losses can be compared by their U values. The higher the U value the greater the heat loss. Ordinary glass has a U value of 2.8 and double glazing with Pilkington K has a U value of only 1.9 which is considerably better than conventional double glazing. One of the best known products being Pilkington K low emissivity coated glass (the coating being sandwiched between the cavity) since then various manufactures have introduced equivalent products Planitherm, Guardian to name but a few, they all work on the principle of reflecting generated heat back into the room and allow solar radiation to warm the panes from outside. A staggering 26% of all domestic heat loss escapes through the windows*. Installing energy efficient windows can save you up to 28% per year on your heating bills compared to traditional windows and frames. use energy efficient glass? Due to the importance placed on the damage to the environment in recent years, as part of the Kyoto agreement, the Government has committed to reduce the amount of greenhouse gases the UK produces. 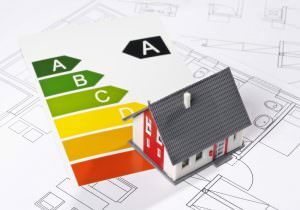 One way has been through stricter Building Regulations concerning energy efficiency. New regulations will soon be in force where the whole window will have an energy rated certificate. By far one of the most influential effects of this will be the glass areas; with new advanced technology this makes way for a complete new Hybrid double glazed sealed unit. Low emissivity’ (Low-e) glass such as Planitherm & Pilkington K Glass is designed to reflect heat from fires and radiators back into your home, greatly improving its thermal efficiency. At the same time, it allows heat from the sun through your window, contributing to its energy efficiency. By using less heat to keep your home warm, less energy needs to be produced, therefore lowering the overall levels of greenhouse gases and the cost of keeping your home warm. Argon is a colourless, odourless, non-flammable, non-reactive, inert gas. Argon gas fills are used to reduce heat loss in Double & Triple glazing sealed units by slowing down convection inside the air space. Argon gas is extremely cost-efficient, and works well with Low-e coated glazing. When we talk about insulation glass without low-e coating, we refer to glass that uses air between panes as a primary source of insulation. As air itself is a good insulator, filling the gap between the glass panes with a low-conductivity gas such as argon improves window performance by reducing conductive and convective heat transfers. This phenomenon results from the fact that the density of the gas is greater than the density of the air. Argon is the most commonly used fill gas, due to its excellent thermal performance and cost-efficiency in comparison to other gas fills. Older style spacer bars were manufactured from aluminium or pressed steel these sometimes had the effect of allowing a cold bridge across the panes of glass sometimes showing a line of condensation to the edge of the sealed unit. Modern products now include, thermal break bars, super spacer bars, warm edge, or carbon spacers all giving the same strength but with increased thermal insulation as they become more popular hopefully the prices will fall. There are many other benefits of installing windows with Super Spacer. It reduces condensation by up to 70%, virtually eliminating the potential breeding ground for bacteria, mould and dust mites that can be harmful to people with respiratory diseases. Super Spacer also reduces noise transmission by up to 2dB which helps you keep your home away from the noise of the outside world. Why use energy efficient glass? 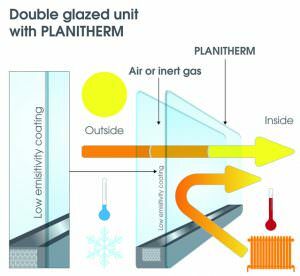 We specify Planitherm glass as standard in our sealed units. On impact conventional float glass breaks into large shrouds. Toughened Glass (also called tempered) categorised as Class A This looks like ordinary glass but receives a special heat treatment process to toughen it. It is much stronger than ordinary glass and on impact disintegrates into small granular pieces, which are not sharp, reducing the risk of injury. Laminated Glass available in Class A, B or C Consists of two or more sheets of ordinary glass which are attached together by a plastic interlayer. The plastic layer provides a barrier and on impact any broken shards of glass will remain attached to the plastic reducing the risk of injury. Wired Glass (also called Pyroshield safety clear/textured) categorised as Class C This glass has a network/mesh of wires embedded in it. Certain types of wired glass can satisfy the impact requirements for safety glass while giving a level of fire resistance. The diagram below gives examples of glazing in windows, partitions, walls, doors and side panels. ‘Critical locations’ are shaded grey. Any glazing within a shaded area must comply with BS 6206. In the diagram glazing unit No. 10 falls wholly within a ‘critical location’ and so the glazing must comply with BS 6206. Where only part of a glazing unit falls within a ‘critical location’ the whole of that unit must comply with BS 6206. In Diagram 1 this applies to units Nos. 2, 3, 5, 6, 7, 9, 11 and 12. Only glazing units Nos. 1, 4 and 8 fall wholly outside the ‘critical location’ and need not comply with BS 6206. Where only part of a unit contains a shaded location the whole of that unit must comply with BS 6206.